The THQ features our new Whisper Drive Technology™ – a brushless motor that is ultra-quiet during operation and virtually maintenance-free. Unlike brush motors, Whisper Drive Technology guarantees accuracy and repeatability, since the motor holds its processing speed to .5% accuracy throughout the homogenization cycle, regardless of fluctuations in sample size or sample viscosity. The THQ operates with patented Omni Tip™ Plastic Homogenizer Probes, available in both soft tissue and hard tissue versions. These probes eliminate concerns about cross-contamination between samples. Stainless steel generator probes are also available for larger and tougher sample types. The Omni THQ is ideal for tissue homogenization, emulsions and suspensions, cell disruption, protein extraction and medical research. 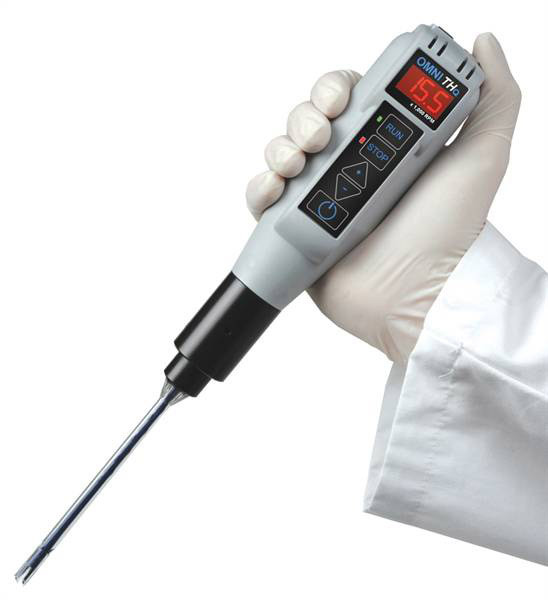 It can be hand-held or mounted to a lab stand for lengthier processing. The THQ's efficient energy saving motor provides the same powerful performance you would expect from an Omni homogenizer. Sound Level: < 65 db.